What are the different types and uses of retaining walls? With just a drive through the Inland Empire area you will see a wide variety of retaining walls around homes, neighborhoods and businesses. The careful observer will note that there seems to be many different types of retaining walls for a variety of different purposes. Retaining walls can be built for decorative or industrial purposes, and in many cases, for both. Bella Terra Landscape Design Service will look closely at the types of retaining walls that are commonly seen in the Inland Empire area to help you choose which retaining wall would be best for your needs. Why use a Retaining Wall? A retaining wall in the Inland Empire area wall can be used in a variety of applications however, the most common use would be to level a slope or grade. This leveling process allows for areas that were once unusable, because of the grade, to now be level. This concept can might be as simple as to level or raise a garden bed; all the way through creating additional yard space strong enough to park vehicles on. What are some Common Reasons for using a Retaining Wall? Retaining wall structures and leveling strong enough for commercial development or vehicle parking. A garden retaining wall is a simple structure ranging between 6 inches and 2 feet that simply provides a decorative enclosure for a garden setting. Also called a screened wall this retaining structure is designed more for an attractive appearance than it is structural integrity. As the size of the garden and the height of the wall increases so does the need for adding a level of reinforcement to the overall build. This retaining wall structure can also be used to level the 5 to 10% grade seen in the front of many Inland Empire homes. NOTE: Careful consideration should be made when creating a garden retaining wall. It should include the proper drainage and structure strength based upon its size. As the size of the structure increases so does the weight that the retaining wall holds back. Depending on the size and use of a retaining wall, one of its purposes is to maintain structural integrity when weight is applied. When a section is created, then filled with back dirt, soil, rock or gravel it will place additional weight and stress on the retaining wall. When you add water from rain or run off, it significantly increases the weight that the retaining wall needs to effectively hold. Part of a professionally installed retaining wall structure will be the addition of proper drainage so that water from rain or runoff can pass through without damaging or weakening the structure. 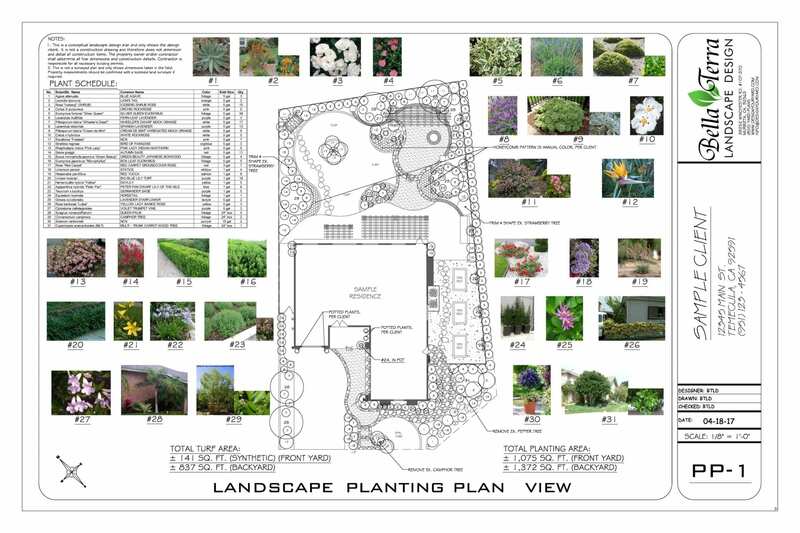 At Bella Terra Landscape Design, we utilize our years of design experience to produce a landscape design plan that exceeds the customers expectations. 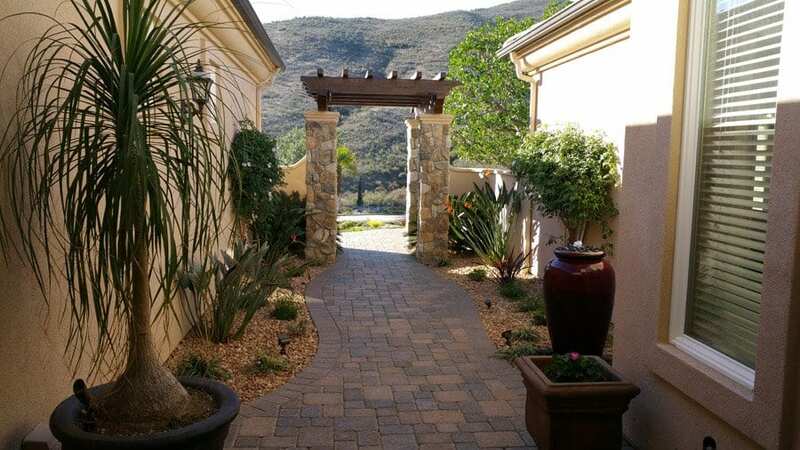 Beginning with a tour and discussion of the Inland Empire area yard we can create, in detail, a landscape design that will transform your backyard into an extension of your Inland Empire home. When choosing to have professional landscape services done, be sure to start with a competent design by a design team that has a methodical mindset. This mindset will provide the path to perfection for your Inland Empire area home. Just about every business owner in the Inland Empire area will tell you that one of the greatest frustrations and challenges that are faced in day-to-day operations is hiring quality personnel. Trying to find someone that has a specific skill set for this type of business is difficult; being that it takes years of training, unquestionable work ethics and a follow-through attitude to excel. Nowadays, as business owners, it seems like we would be just happy if we could find a few applicants that would simply follow instructions. 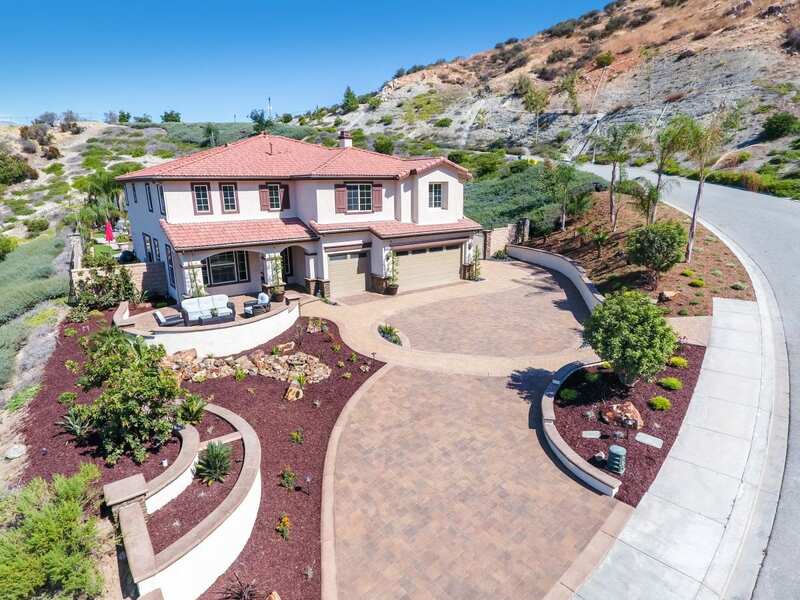 It’s no secret in landscaping industry, and other service related industries in the Inland Empire area, that young people today lack many of the “work hard” traits that we reflect on as a core principle. Finding a young person that exhibits a work ethic is literally a diamond in the rough. 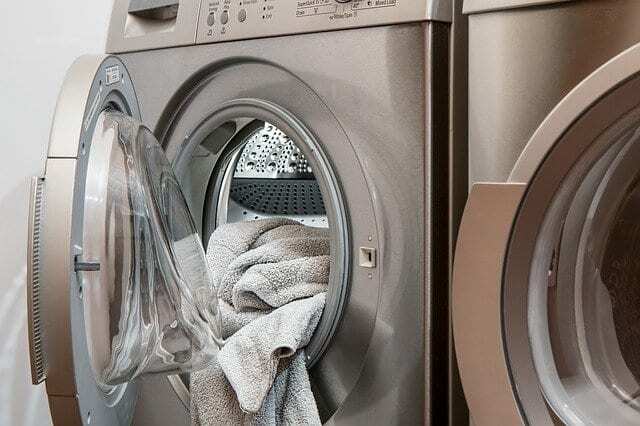 As business owners, and parents, I would like to take this article to reflect on some core values and more specifically: the importance of chores. Do as I say, not as I do. For years I have heard this expression and disliked it. It might sound good when you’re talking to a six-year-old child; but, in reality it avoids our personal responsibility to teach our children based upon our words AND our actions. Often times a young person’s solid work ethic comes from watching the work ethic of their parents. By showing them what hard work looks like our children will see hard work as “normal” rather than the exception. By setting the ensample for our children we can help produce in them a strong work ethic that will lay the foundation of success for many years to come. Household chores are simply a way to help children become acclimated with work. However, if used properly, chores can also teach children responsibility and accountability. Simply doing chores to get them done, without accountability, is just a way to get free labor; we should rather use chores as a teaching tool. Just as an employer in the Inland Empire area would challenge their employees to complete the task as stated, chores should be handled with the same responsibility and accountability. As stated: Completing a task the way that you were told or shown how to do. Not how you think or perceive the task should be completed. If the chore is to take out the trash, was it done exactly as stated? Was it taken out on time? Did the trashcan get cleaned? Did a new trash bag get placed in the trashcan? By following through and making sure that the chore was completed as stated you identified to the child your expectation. By holding the child accountable for the proper completion of the chore you help teach them the same accountability that they should have when working for their Inland Empire area employer or for their customer! Holding the child accountable for the completion of the task to be done exactly as stated requires as much work for the parent as it does for the child. The child should know that our most important goal is that they learn how to complete a task as stated. (Not how they think it should be done). If we, as parents, do not check that the task was completed as stated (to our complete satisfaction) we show them that they can get away with slacking on the task; thus identifying our work ethic towards their learning. Remember we should never consider chores as free labor, it should always be utilized as an opportunity to teach a solid work ethic. A few years ago, I listened to the frustration of one of my clients who owned a Sonic drive-thru. 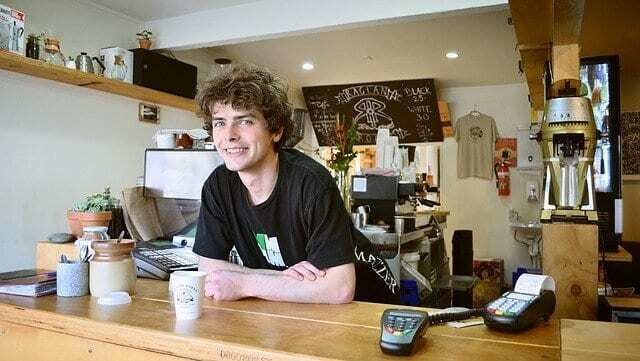 He expressed his frustration that it seems like, to him, that he had to teach young people how to work as much as he had to teach the responsibilities of the job. He had to teach young people that had graduated high school how to properly wash their hands, how to count back change, how to speak to others with respect and how to properly complete a task, completely, as stated. Basically, he was frustrated because he had to become their parent rather than their employer. Those young people that were taught a solid work ethic generally found themselves in a management position inside of three months. This article was not meant to point out the problems with anyone in the Inland Empire area’s parenting abilities. Nor was it meant to identify that somehow my capabilities to parent were better than anyone else’s. However, I think we all, as citizens of this diverse community; can agree that there has been a decline of a strong work ethic in our young people. As a business owner and as a parent, I am always evaluating my role and willingness to share the lessons that I have learned. If there’s ever room to improve, I want my children to seek those improvements; to go further, better and achieve higher levels of success. I also know that in order for them to go beyond my means they will need a foundation that is as strong as that will to achieve. 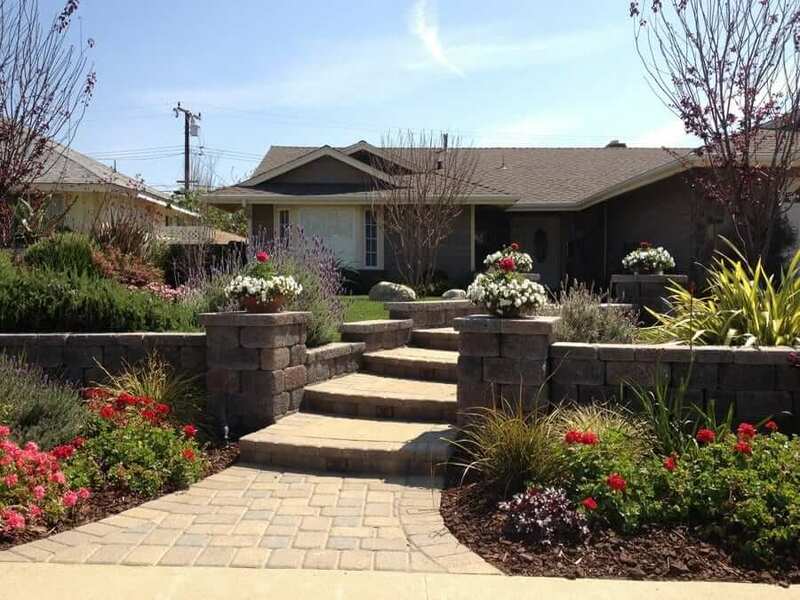 Retaining or retention walls are widely used in the hardscape and construction industry to solve many practical and aesthetic issues associated with erosion or property development in the Inland Empire area. Having many practical and aesthetic uses retaining or retention walls can also be very attractive, functional and add value to your home and property. Bella Terra Landscape Design knows well the importance of retaining and retention walls for homes in the Inland Empire area; here are a few great benefits of retaining or retention walls. Curb appeal can often set the stage between whether a potential buyer might choose your Inland Empire area home or not. Homes that have a clean curb appeal with thoughtfully minded landscaping can really help increase your home’s value in both aesthetics and in property value. For many Inland Empire area homes the slope of the yard can often deter a potential buyer knowing that a useful portion of the property is, by definition: unusable. By the addition of retaining or retention walls, along with thoughtfully minded landscaping, you can add form and function to your property assisting with curb appeal and increasing your property value. As a professional Landscape design service, we know that there are practically no shortage of choices when it comes to blending the aesthetic of your retaining wall to your Inland Empire area home. When meeting with the owner, one of the determining factors will be, the materials used in the design and development of your retaining wall. Because retaining wall technology has been partnered with the aesthetical mindset over the many years; many choices are available to help you get a functional addition to your landscape as well as something that will accent the look of your home. Once you have your retaining or retention walls professionally installed, very little maintenance is needed. By their very nature a properly constructed retaining wall can last for many years because they are designed to be rugged by necessity. A properly constructed retaining wall can hold back thousands of pounds of earth and water over decades when quality materials and professional construction methods are utilized. Retention walls can provide structural slope retention integrity from 50° to 70° worth of angle meaning that you can have an eye catching and functional component to your Inland Empire landscape. Retaining walls are made from natural, earth friendly materials backed by foundational sedimentary elements such as sand, gravel and river rock. Add to that the very nature and use of retention walls, to prevent erosion of landscape slopes, and you get an environmentally friendly option for your Inland Empire property. Because of the retaining walls capability to reduce erosion you also can see reduced disruption to the natural vegetation found in greater sloping and larger landscapes. During this holiday season it is important to be mindful about the many things that Bella Terra Landscape Design, providing professional landscape design services to the Inland Empire & surrounding areas, has to be thankful for. Even as the end of the year continues to approach, we find ourselves echoing our thankfulness as we look back across 2017. No business in the Inland Empire area can be successful without customers, ours is no different. Perhaps the thing that we are most grateful for is how incredible our customers have been to us here at Bella Terra Landscape Design. While we have worked hard to provide our customers with value added services; we continue to be amazed at how gracious our customers have been. Much of our business comes from customer referrals that has been shared with friends and family, perhaps the greatest complement that we can receive from our customers is a referral. It is also important to note that many of our customers have become good friends, desiring to partner with our vision and participate in our work ethic. As 2018 approaches, we want to say a hearty “thank you” to the many customers that have made the choice to utilize Bella Terra Landscape Design for their professional landscape design service needs in the Inland Empire area. In the professional landscape design industry your business is only as good as the talent that you have working for you. 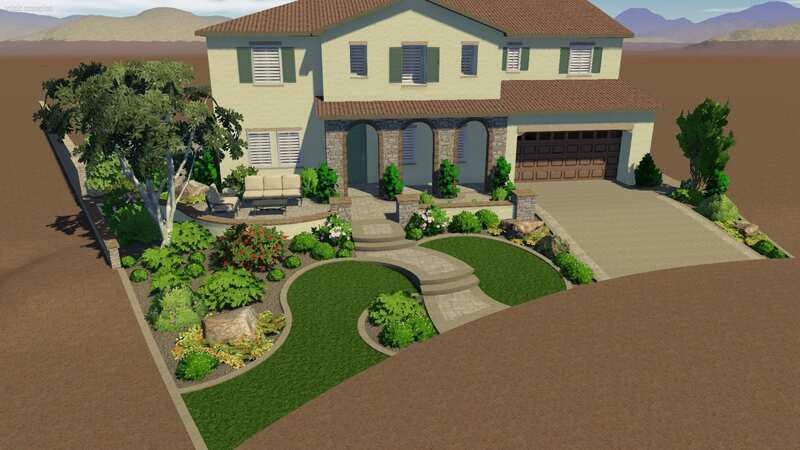 At Bella Terra Landscape Design, we have been blessed to have the best professional landscape designers and assistants in the Inland Empire area that have chosen to partner their talents with us. It is their patience, perseverance and attention to detail that has shown through in their workmanship to our many thankful customers. The owner and management would like to extend our deepest thanks to all of the team members here at Bella Terra Landscape Design. It is our desire that 2018 builds upon the success of 2017 and that our friendship grows stronger with each passing day. We simply could not have had a successful year without the outstanding talents of each and every member of our team. 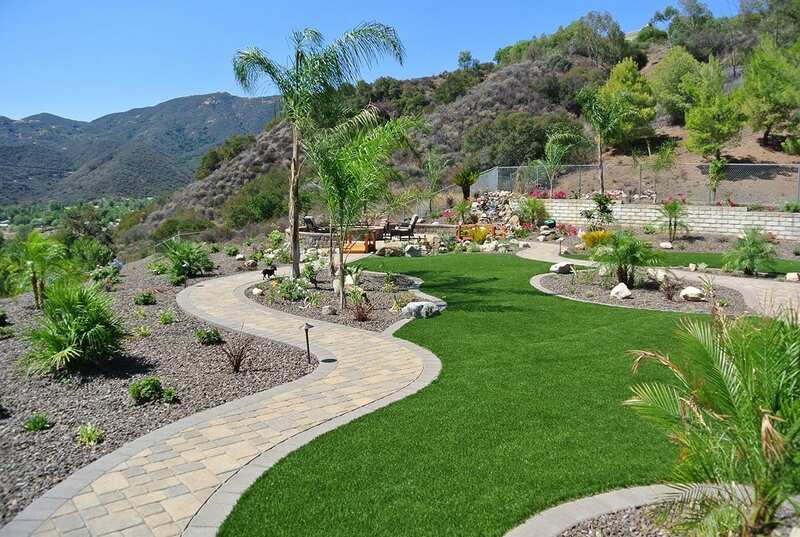 Building a successful professional landscape design business in the Inland Empire area often requires sacrifices of time. Sometimes professional landscape design interviews cannot be done during regular business hours and requires a dedicated team, able to be flexible to the customer’s time constraints. Perhaps the greater sacrifice made in these times is that of our families. All of the staff and team members of Bella Terra Landscape Design that wish to extend our gratefulness to the sacrifices that our family members have made throughout 2017; your sacrifice does not go unnoticed and is very much appreciated. Another factor that has made 2017 a success for Bella Terra Landscape Design is the partnerships that we have been able to make. To the dedicated staff that works with our website to the companies that install our designs, we want to say thank you for the level of service that you have provided to help make us successful. To our vendors, materials suppliers and others that have shared in the business model and vision of Bella Terra Landscape Design, we want to say thank you. There are so many things that, honestly, we could take the time to say that we are thankful for. We would be remiss to not take a few moments to acknowledge how thankful we are to be able to have a professional landscape design company in such a great country. The sacrifices that soldiers, airmen, sailors and marines make (as well as their families) to keep us safe and free does not go unnoticed and we are truly thankful. Furthermore; the daily sacrifices of our dedicated public safety officers (police, fire and EMT’s) make to help preserve the peace on the streets of America is certainly appreciated. It is the sacrifices of individuals such as these that make it possible for companies like ours to prosper in this great and free nation. As 2018 quickly approaches we look forward to being able to continue a work ethic that has allowed us to provide great service to our customers; with the anticipation of many years to come. At Bella Terra Landscape Design, we utilize our years of design experience to produce a landscape design plan that exceeds your expectations. Beginning with a tour and discussion of the Inland Empire area yard we can create, in detail, a landscape design that will transform your backyard into an extension of your Inland Empire home. When choosing to have professional landscape services done, be sure to start with a competent design by a design team that has a methodical mindset. This mindset will provide the path to perfection for your Inland Empire area home. How Much Should a Professional Concrete Construction Service Charge? At Bella Terra Landscape Design, we often get ask how much should the companies that utilize our designs charge to install or construct the different elements of the design. The old adage of “You get what you pay for” perhaps was perfectly coined for landscape services. Of any, in the service industry, that this might hold true for; Concrete Construction services perhaps fits this adage the best. All you need to do is open the phone book or do a Google search to find dozens of companies or individuals in the Inland Empire area offering professional Concrete Construction services however, when you call these different services you quickly find out that there is a huge range of prices that are being provided for essentially the same services. To better answer the question of: how much you should pay for a professional Concrete Construction project such as: driveways, patios, concrete staining and retention wall installation; let’s analyze what goes into the charges vs. the outcome. When considering a professional concrete construction service, it’s important to get to know the company that you’re going to select prior to signing a contract. This is a service that you will be bringing into your Inland Empire area home, often without supervision, so it is important to make sure that you are hiring a professional construction service that you can trust. How long has the professional concrete construction service been in business? Do they have a screening process for their employees to include drug and criminal background checks? Do they use top-quality materials for their projects? Are they locally owned and operated or a national chain? Are they licensed and insured for your protection and theirs? Do they use high-pressure sales personnel or does the owner participate in estimates? Do they have a warranty or guarantee on products and workmanship? With any business in the Inland Empire area, overhead is one of the main factors that determine the cost for a product or service. For the professional Concrete Construction industry, companies must compensate for business expenses such as advertising, wages, benefits, transportation, materials and equipment; not to mention proper state/ local licenses and being properly insured. Companies that have less overhead can naturally charge, at times, less for their services… however, then this is where the adage really comes into play: “you get what you pay for”. Companies that skimp in these various areas mean that you may not getting the best products or services to offset what you’re paying for. For example: A Concrete Construction company that would choose not to be properly licensed and insured would mean that they can charge less, because they have less overhead. However, if something should be damaged during your concrete project such as: driveways, patios, concrete staining and retaining wall installation due to inappropriate materials, carelessness or negligence of their employees… YOU are left with little to no recourse. One thing that has been discovered in the professional Concrete Construction industry for the Inland Empire area is that there is a level of expectation that is perceived for Concrete Construction services rendered. This means that services that you hire to have done, you hold at a higher standard than services you would normally do yourself. It is this very reason that professional Concrete Construction services may take twice as long to do a task that might be perceived as simple. This is because a professional Concrete Construction service knows that most customers will be giving them the “white glove” test; therefore, everything must be perfect. It is also why you should insist on a walk-through upon completion. This is to make sure you are 100% satisfied before they leave, it will also help with a potential disagreement with any workmanship guarantee if something should be discovered within the guarantee period. Note the wording: professional. Comparisons that are made are from the viewpoint of a professional Concrete Construction service where they are properly compensating employees, using quality materials and are properly licensed and insured. Some projects can be calculated based upon a [menu price rate x square footage = total price]. This equation allows for a competitive rate that only fluctuates based upon the size of the project. A driveway or sidewalk project would fall into this category. Other times pricing must be determined based upon the projects needs such as a paver patio project. Because a paver patio process requires detailed measurements, specific materials that fluctuate in price and the overall design aesthetic that the client is looking for; a specific estimate would need to be calculated. Water restrictions keeping your lawn from looking great? – Check this out! While the landscape of the Inland Empire area lends itself to beautiful views, rich culture and diversity of features it also presents a unique set of challenges unlike anywhere else. One of these unique challenges is the consistency of irrigation that we have available to us. 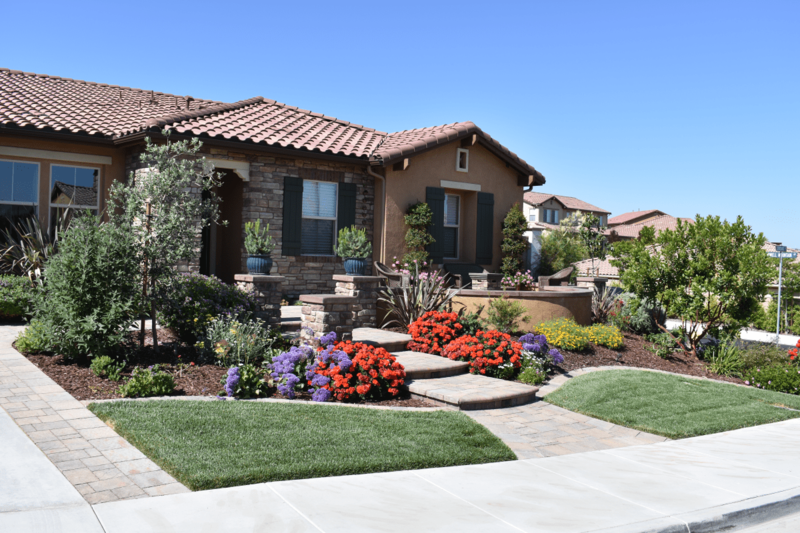 Those of us who have called the Inland Empire area home for many years have become accustomed to living in the warmer climate where droughts and watering restrictions exist, hence the challenge; how can we have a beautiful, consistent lawn with these types of water restrictions? Because of these water restrictions, large plush grass areas are not an option; so, we need to get creative: enter synthetic turf. Now I know what you are thinking, and quite frankly, I thought that way to. I, like many, for several years have been anti “fake grass”. Not only did it feel horrible when walking on it bare foot, but it also looked like a giant green carpet. Just like many of the innovations that we have revealed in the different articles and information on our website, synthetic turf has also come a long way. 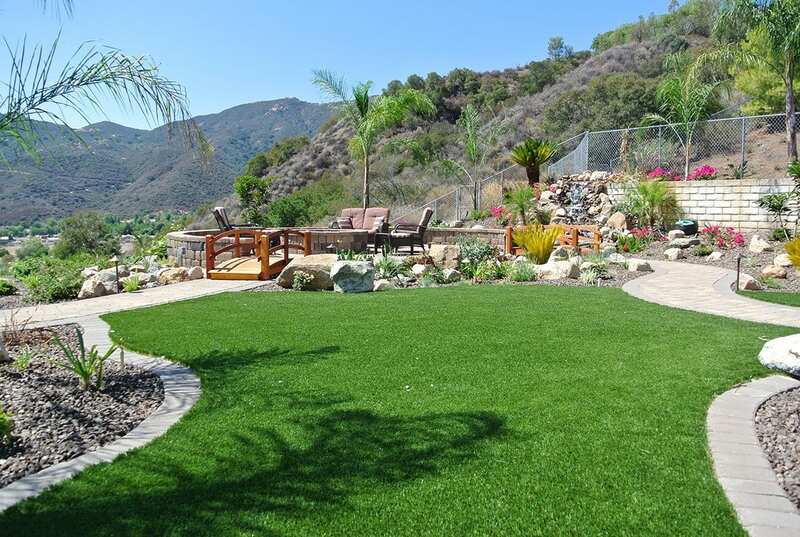 Let’s look at a few things that might make you consider synthetic turf is a viable option for your Inland Empire area home once again. Long gone are the days of an obviously fake and plastic looking lawn. Today there are some fantastic options to choose from for your Inland Empire area home. There are triple color blends, for example, that even look like they are in need of a bit of water. Brown thatching has also been implemented that really give these new turf options a great natural look. Longer blades are also available now that give the turf a more realistic look and feel. Speaking of feel, heat repellents are now used so that the turf does not burn our tender feet in the hotter months. With the old days of artificial turf, the issues with cleaning up after our furry friends was enough to make you want to rip the turf out by hand! However, the same clever people that put research into the better aesthetics and features of synthetic turf had our furry friends in mind as well. When properly installed, synthetic turf is built upon a base that allows for the absorption and dispersal of rain and… urine. 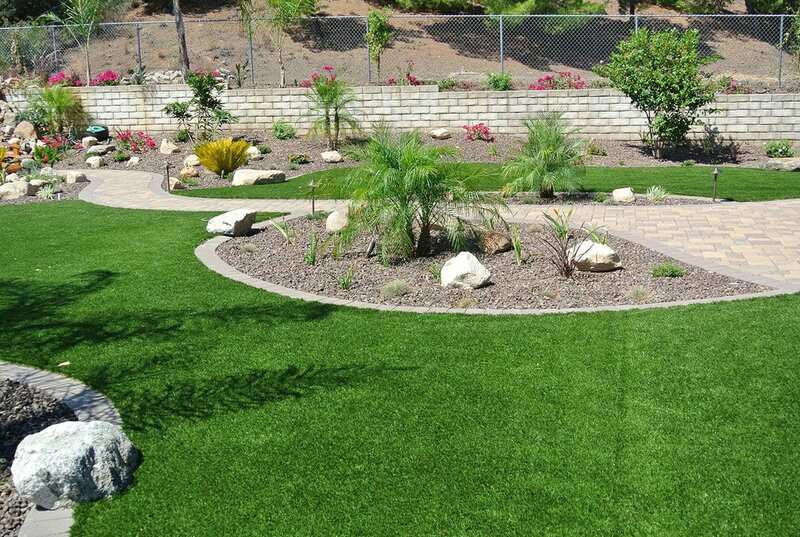 If you are going to be looking at more than an occasional mess, such as those Inland Empire area homes that would regularly have pets use the artificial turf as their bathroom, then specialty disinfectant pellets and drainage patches are available to keep your synthetic turf looking, and smelling, great. Just because synthetic turf is a viable option for those of us that live in the inland Empire area, that doesn’t mean it’s super cheap. Careful consideration should be given as to how long you intend to have the synthetic turf as your primary or secondary surface in your landscape. Even though the process for installation of synthetic turf has been standardized within the industry, bringing down costs, it still requires multiple layers of sediment and material as well as the labor to install. Naturally the larger the area, the greater the cost. 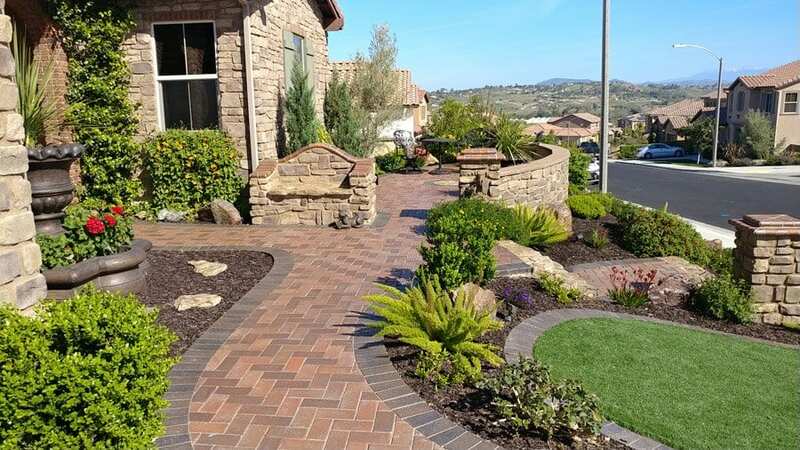 Just like any good landscape design when you mix and match materials rather than utilizing one material over a large area, you can create an eye pleasing landscape that will become the envy of your Inland Empire area home. Rather than installing a large area of synthetic turf, consider using the synthetic turf to accent brick or paver stones to create an elegance and tranquil environment that is not only easy on the eyes, but extremely low maintenance as well. Now we have a very realistic option when dealing with droughts and watering restriction challenges. 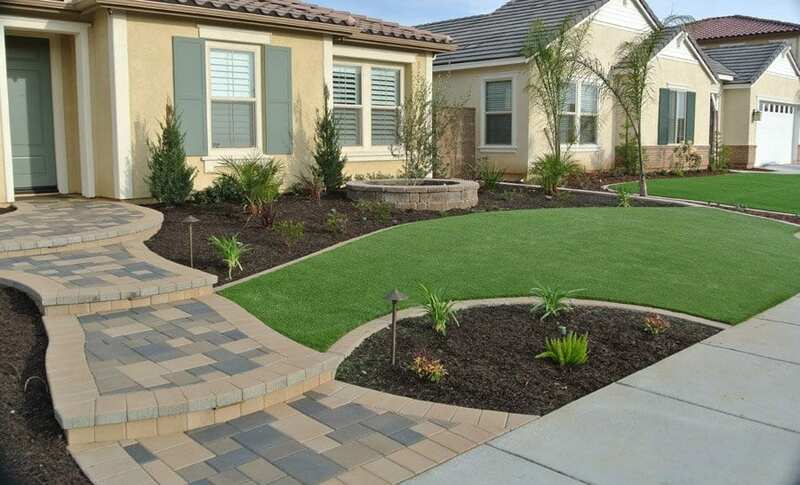 With options like synthetic turn and creative landscaping you can keep your Inland Empire home looking great and save money on water and maintenance! All we need now is a way for someone to have that synthetic turf have freshly mowed lawn smell. 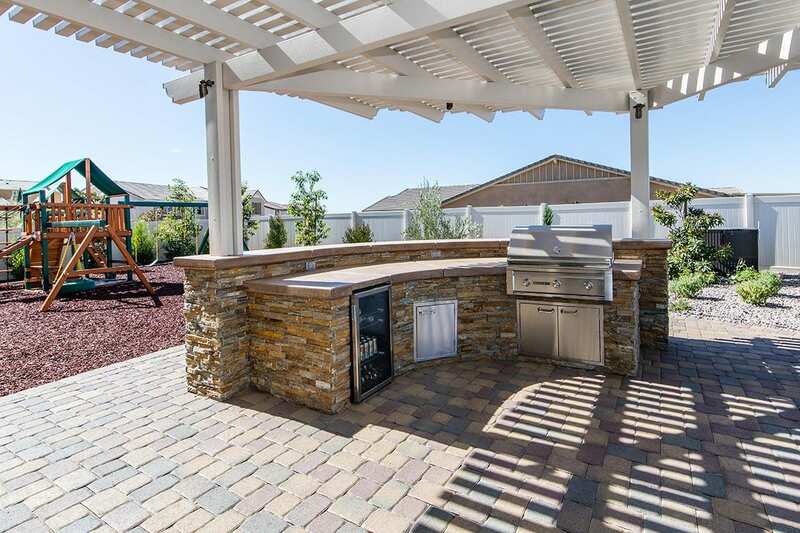 When you are looking to create the ultimate backyard getaway for your Inland Empire area home, many features come into play. We naturally want a beautiful yard, but one that is functional as well. We desire to have a good curb appeal, but desire to have a low maintenance situation that make our lives just a little bit easier. At the end of the day you want to achieve a yard that makes you proud of your home. Part of this, as mentioned above, is functionality. 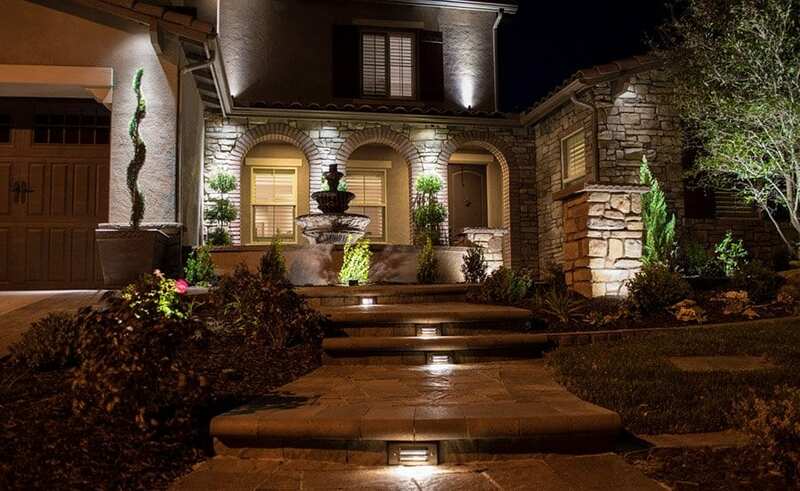 Having the appropriate landscape lighting will not only help bring a level of beauty and sophistication to your Inland Empire area home; but increase its functionality. Check out this useful article on bright ideas for outdoor landscape lighting. We all know that adding colorful plants, textures and centerpiece attractions such as water features can help to set the stage for your beautiful Inland Empire area home landscape. However, as evening comes upon us, so does the ability to showcase your beautiful landscape; this is where landscape lighting comes into play. Lighting your home and garden not only provides security, but also allow you to showcase and enjoy your yard every day and into the night. It is such a great feeling to arrive come home at night to see your house properly illuminated. Plus the added security of lighting, both your home and garden, is a great deterrent for those that may want to sneak in unawares. With the further development of low voltage lighting options that allow the average home owner to install anything from a basic setup to an elaborate system with multiple zones and colors; it brings greater options than what was available just a few years ago. Outdoor halogen bulb lights are a thing of the past. Today LED bulbs are the way to go, being they are much more affordable and vastly available to the masses; not to mention that utilizing LED lighting will naturally save electricity and money. With many box stores (Lowe’s, Home Depot) offering outdoor LED lighting options for your home and garden, competition has helped to keep the prices low. When you add some newer technologies such as remotes, color changing capability and light sensing features; you’ll find the prices start going back up. When you consider that choices range from standard white LED lights to lights that can change color and brightness based upon conditions or choices, you can see that the only limitations are your imagination and budget limit. 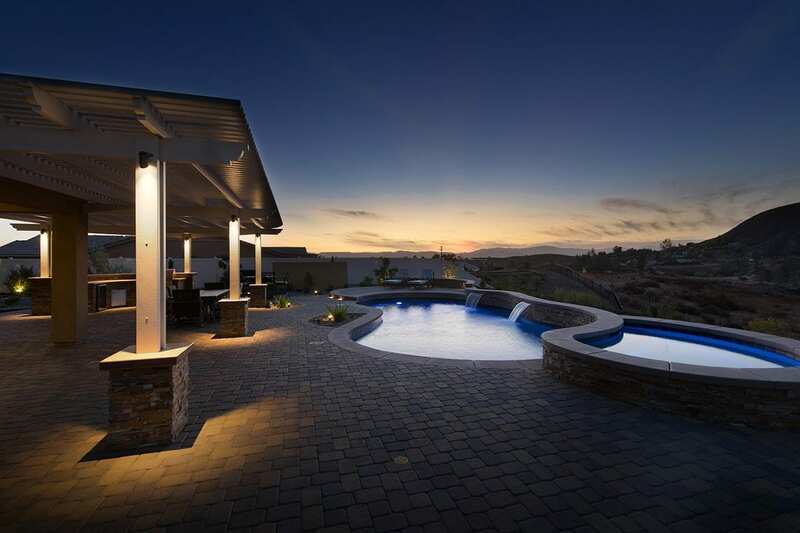 When it comes to designing outdoor lighting for your Inland Empire area home it should always begin with the basics. Softly Illuminate steps and walkways for safety then spotlight focal point trees for an instant change in the appearance of your home and garden. Consider using a combination of both soft and spotlight lighting to create an ambient mood or tone for your Inland Empire area home. From there everything else is a bonus. 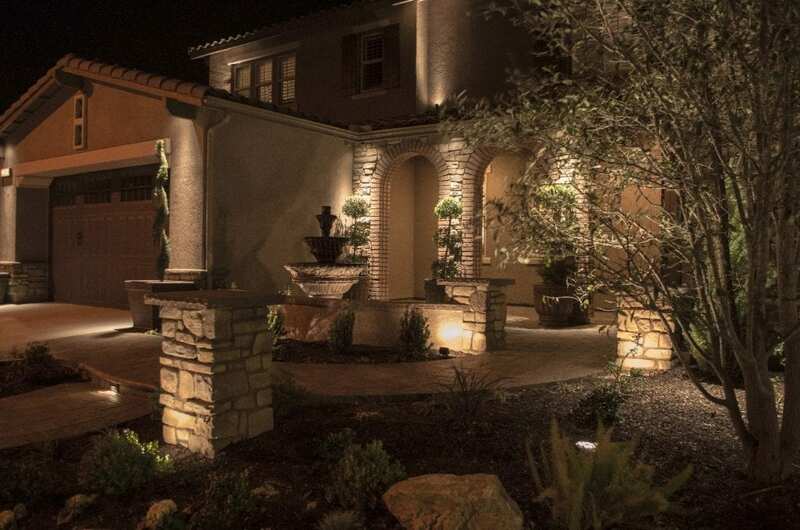 At Bella Terra landscape design, we enjoy down lighting the front façades of our client’s homes by placing fixtures behind the eves of and pointing them down to illuminate and showcase the home. This adds immediate security, curb appeal and that amazing wow factor. There are lighting fixtures that will showcase lower planting material, cast shadows up against walls and some will illuminate water features from the inside; allowing you to enjoy water fall effects by day and the call me illuminated mood of serenity at night. Outdoor Landscape lighting is powered by an outdoor transformer. This is a power unit that plugs into a standard 110 outlet. Most come with, at the very least, a timer clock to control what time the lights turn on and off; however, many now come with a photo cell that allows the fixtures to turn on automatically as soon as the sun goes down and it becomes dark. For those that like all of the extra bells and whistles that are out there, Bluetooth transformers provide the additional ability to control your outdoor landscape lighting for your Inland Empire area home with your cell phone, tablets or even our voice operated. With Bluetooth technology so readily available creating outdoor lighting scenarios to different areas of the yard is a snap. Utilizing smart technology, with a press of a button or a simply voice command, it is possible to illuminate different areas or zones of the home or garden. Imagine one control button or voice phrase turning off all lights except for a few path and step lights that leads to the hot tubs for a romantic or relaxing evening! We spend a lot of time and money to beautify our yards for our entertaining or showcasing purposes. Adding outdoor lighting to our landscape will enhance and extend our capabilities to entertain and show off the beautiful landscape that you’ve worked so hard to perfect. 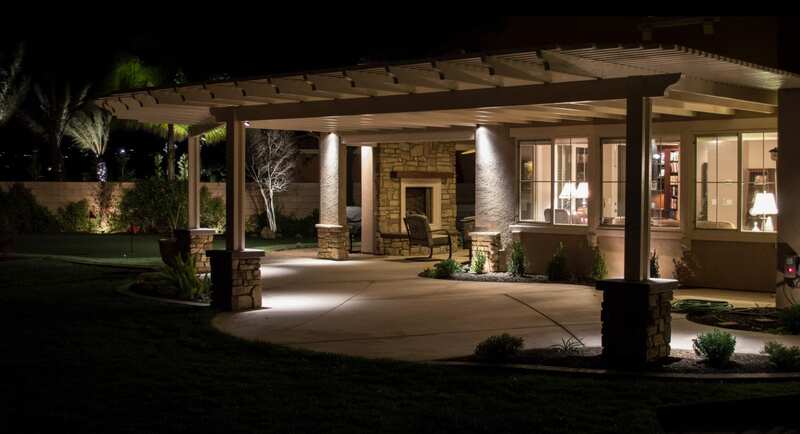 When integrating further technology into your outdoor landscape lighting, you bring a high level of style and sophistication to your Inland Empire area home that will make your home the talk of the next gathering. With just a small budget and a lot of creativity, you can create outdoor lighting options to really brighten up your landscape; and when you integrate landscape lighting into different zones of your home and garden it takes the functionality to the next level. I’m building a pool, should I act as my own general contractor? 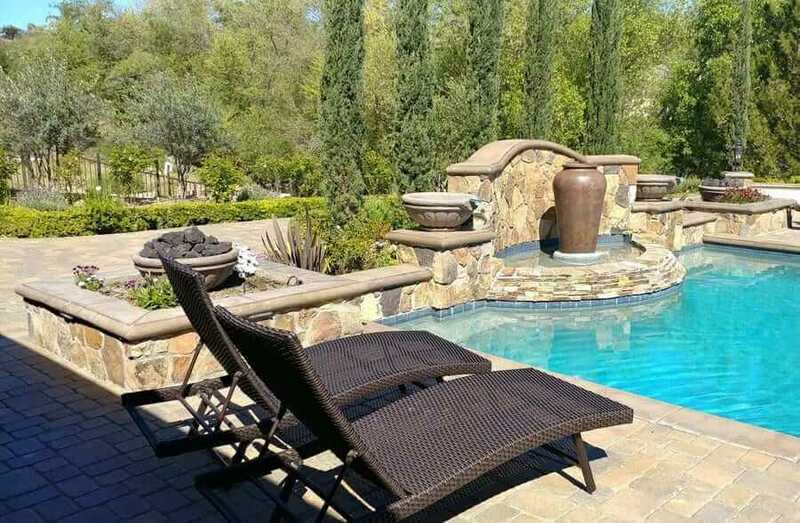 Ah… a swimming pool… relaxation, style and possibly; the talk of your neighborhood, who wouldn’t want a swimming pool for their home in the Inland Empire area. So most would start with interviewing swimming pool contractors, I mean, that would be the first logical step, right? Yeah that would be a good starting point. There are a few however, that plan on bypassing that step altogether, planning to put on the Contractor’s cap and make it happen. For those… allow me to say: As owner of a Landscape Design firm for the Inland Empire area, I have interviewed and spoken with hundreds of people who plan on having a pool built; from time to time, I run across a client who is “gung ho” acting as their own GC. To those who decide to go that route: “I say, good luck”. In this article, as a landscape design professional I would like to detail my answer to the question: Should I act as my own general contractor when building a swimming pool. 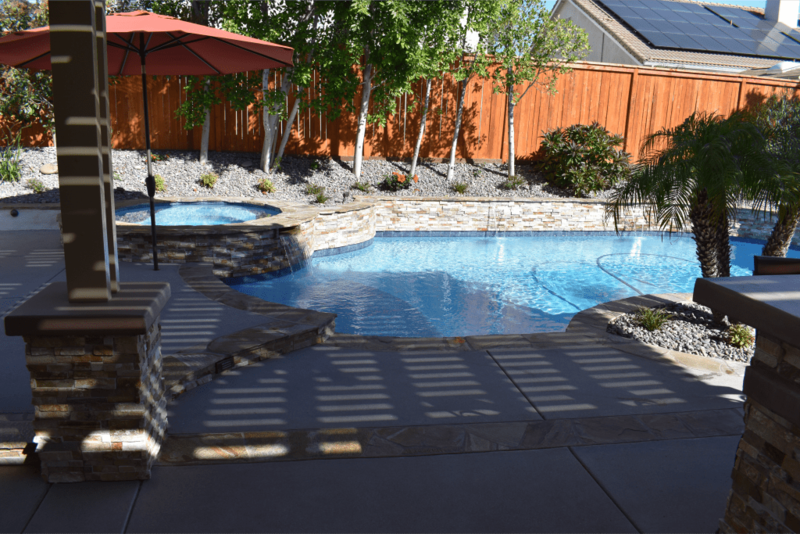 The process of building a pool in the Inland Empire area is not difficult with a general knowledge of construction, a detailed plan, access to appropriate materials and finding the right sub-contractors. 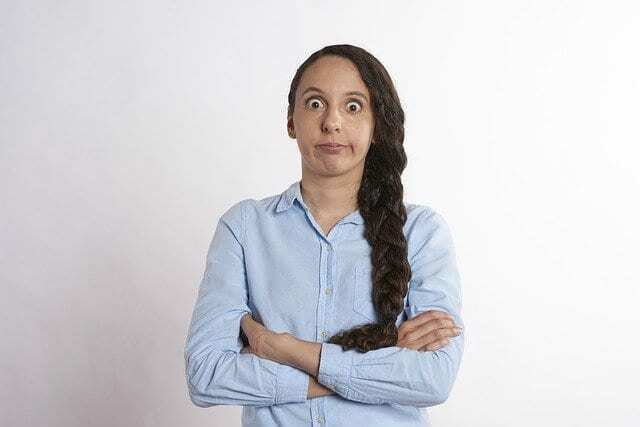 Under this perfect scenario you could certainly act as your own general contractor… However, all of these factors would have to be perfect; otherwise it will become a scheduling nightmare as well as a marriage tester. There seems to be a large misconception that acting as the general contractor or owner builder of a pool project in the Inland Empire area will save lots of money. It may be true that there will be savings, but the amount you say might not be as much as you think. 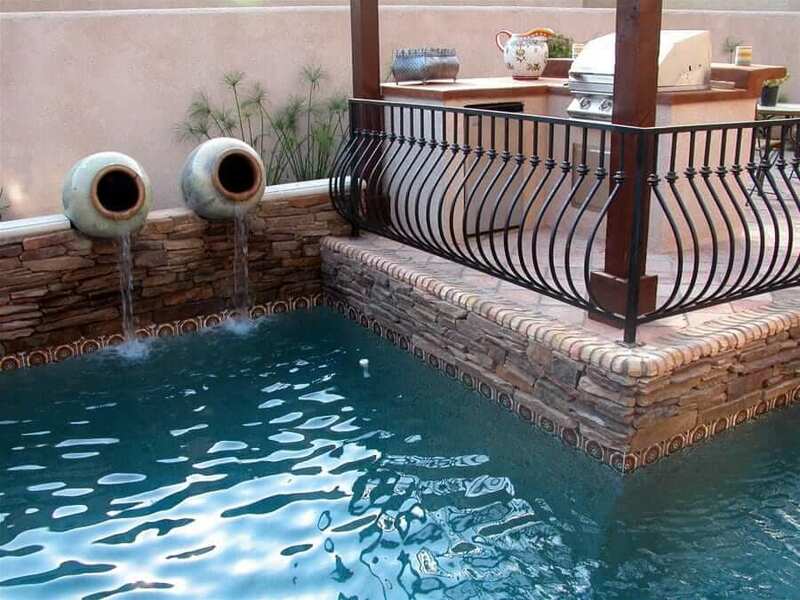 Most general contractors only make anywhere from 10-20% on a standard pool installation project. EXAMPLE: On a $35,000 pool that’s a potential savings of s $3500-$7000. Yes, that is a substantial savings, but in the bigger picture you may end up spending more than that trying to be your own general contractor. Lost wages, contractor delays, incorrectly processed permits and … marriage counseling. There are many steps in building a pool. Getting the pool design properly drawn out to scale and engineered. Plans must be stamped and taken to the City for a building permit to be issued before any work begins. Interviewing, hiring and managing sub-contractors. This requires someone who is prepared to invest many hours in scheduling, making phone calls to confirm, weather delays and assuring no “toes are being stepped on” by contractors working on the job site simultaneously. Scheduling Inspections; you will need to be available for Inland Empire area city or county inspectors to come by during the process. You may need to schedule weeks in advance and co-ordinate that with contractor schedules. This will naturally require additional time out of your schedule, 2-4 hours at a time. Don’t get me wrong, I am not trying to discourage anyone from trying to save some money, it’s just that I have seen many try and regret doing so. The time, patience and sometimes frustrating days involved simply become too much for many to endure. 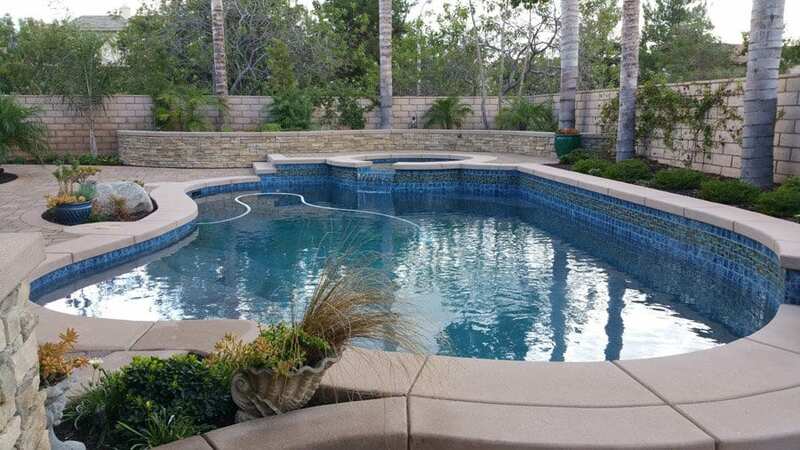 By having a professional from the Inland Empire area who is responsible for scheduling, hiring, payment processing, materials, coordination, inspections; basically all the steps needed to get the pool through final inspection and cleanup. By utilizing a general contractor who has on paper, quality verified experience, will make your pool project faster… and maybe even cheaper. In the end, we all want the same thing. A great pool for our families to enjoy for a fair price without the headaches involved with the construction process. Stay smart and hire a reputable contractor. Be involved with the material finish decisions and when it is done enjoy the fruits of your labor poolside! At Bella Terra Landscape Design, we utilize our years of design experience to produce a landscape and pool design plan that exceeds your expectations. 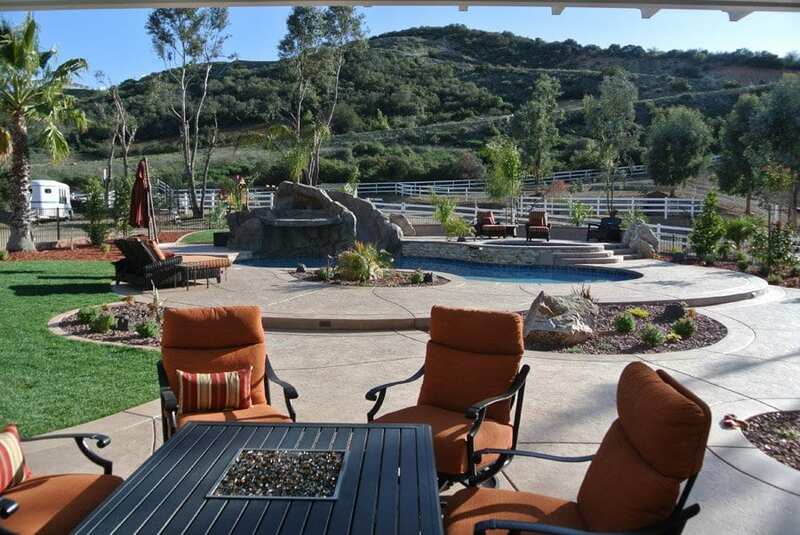 Beginning with a tour and discussion of the Inland Empire area yard we can create, in detail, a landscape and pool design that will transform your backyard into an extension of your Inland Empire home. When choosing to have professional landscape services done, be sure to start with a competent design by a design team that has a methodical mindset. This mindset will provide the path to perfection for your Inland Empire area home. When setting up the perfect backyard design for your Inland Empire area home there are many main features to consider: landscaping, drainage, water features, seating areas, swimming pool layout and more; but the one feature that can really help establish a focal point is a fire feature. From the moment man discovered fire we have benefited from its many functionalities, providing us with warmth on a nice cool night is definitely one of them. But a well designed and crafted fire feature will help provide the opportunity to socialize around an open fire with friends and family; making it a “must have” for our professionally designed and landscaped yards. When considering fire features for your backyard or garden layout it really comes down to two choices: Fire pits or fireplaces. 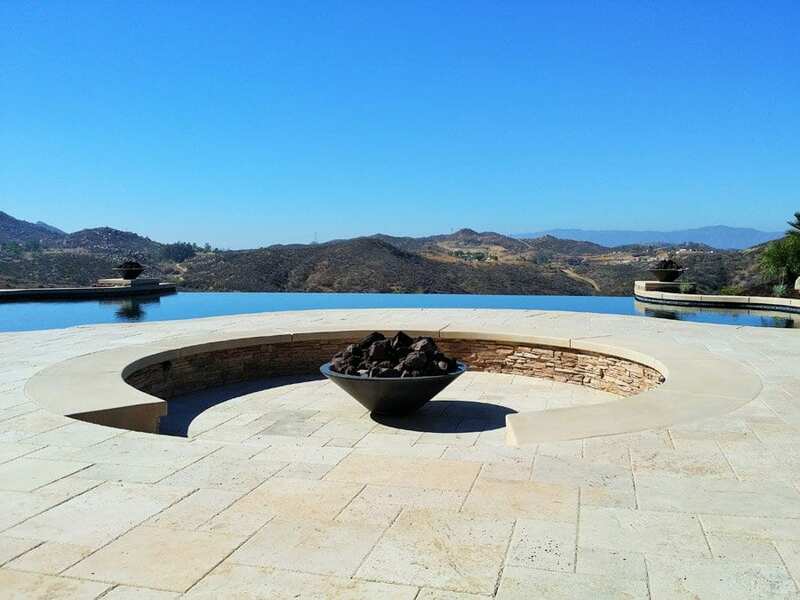 Of the two options fire pits are the less expensive, and in my professional opinion, the more functional choice for your Inland Empire area home. Fire pits are typically round, although they are available in many shapes, but the key feature of a fire pit is that it allows more people to to be able to sit around it, enjoying the warmth and fellowship. When laying out a proper fire pit it’s important to note that fire pits are our best when they are lower or at ground level so that they can provide more heat by design. Ideally the lower to the ground the better for maximum warmth. For safety purposes fire pits should be anywhere from 12” to 18” tall. Taking into consideration that most outdoor chairs and seating are typically 18”-20” tall, we recommend keeping a fire pit at 12”-14” tall so that it is not only safe but functional as well. This allows you to place your feet on the fire pit edge without the heat feeling too uncomfortable. Fire pits can be constructed to operate on either gas or wood. The gas option, of course, will be the cleaner choice and easier to maintain but, burning wood will provide the crackle and the great smells we enjoy when camping. Gas fire pits offer many choices for the top material to cover the fire ring. Most utilize lava rock, as it is inexpensive and functional, others might choose decorative glass as it is beautiful and very common as well. A wood fire pit will constitute more work and clean up. They can be as simple as a ring made up of concrete or metal or can be more elaborate with a decorative stone veneered show piece with a nice finished cap. 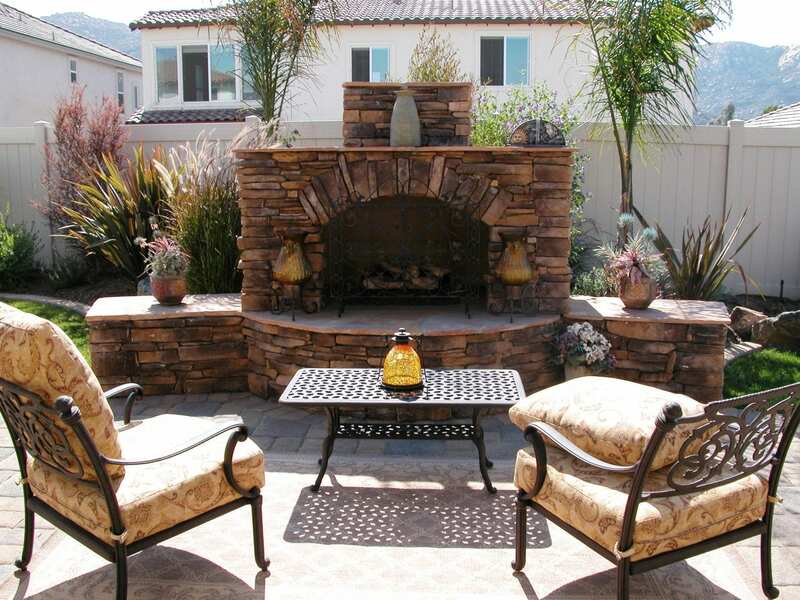 Fire places can be a gorgeous focal piece to our Inland Empire area home’s yard. They can be an element that we place under a patio cover or a center piece to a destination away from the house in an area open to the stars above. As with fire pits they can be either gas or wood as well. Both fuel sources will provide warmth but, the wood option will provide will be warmer. An outdoor fireplace is typically built out of block and concrete then veneered with a decorative rock or stone. There are prefabricated units available as well that are made from aluminum framing and are sold with a multitude of finish materials. The prefab option is much lighter in weight but, in my opinion, do not look or feel as substantial. Prices of course will vary but, both options should be similar in cost. They can have a seating hearth and a decorative mantle as finishing pieces. 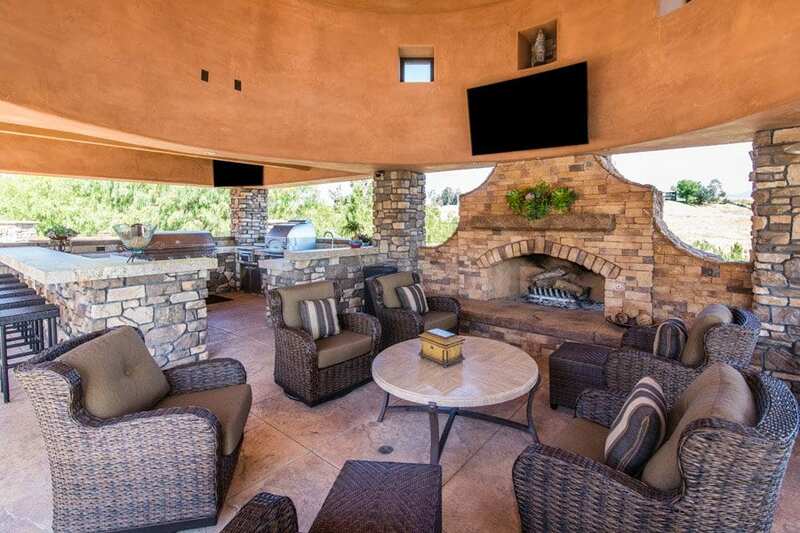 Both fire features provide heat with the esthetical advantage to work with your particular landscape design for your Inland Empire area home. Because fire places are built unidirectional, less people will be able to sit in front or near the fire which will make for a more intimate setting. Fire pits are fantastic for larger gatherings as it allows for more people to sit around its perimeter. A fire place will always provide a more majestic feel as a focal element while the fire pit will be a simpler and less expensive option; but provide more functionality for large groups. Both are great options and a must have for any family that enjoy the outdoors at night. Pondless Water Features… The Right Idea! Who doesn’t love the fantastic sound of cascading water or a bubbling brook? It’s really one of life’s simplest pleasures. Water features are something we all would love to incorporate into our yards or gardens, but we often let the cons outweigh the pros. 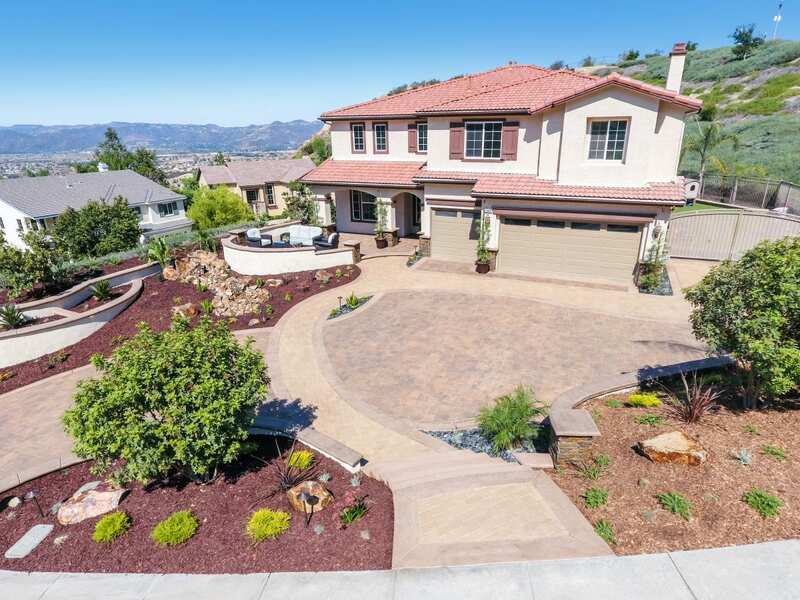 Whether it be a natural boulder water fall, a water wall with a spillway or a bubbling urn; the intrigue and desire for wanting a water feature that will be the centerpiece of your landscaped, Inland Empire home is there; but…. who wants to deal with the maintenance of a water feature? We have to admit, when you see a professionally landscaped home that utilizes a water feature pond with a nice waterfall your first impression is… I want one! But when you consider the maintenance of a water feature with a pond you quickly talk yourself out of it. Prefab fountains and most water features built by a homeowner or contractor have an above ground water basin or pond. This basin acts as a storage area for the water and utilizes a pump to give the water effect. Utilizing a basin that is large enough to provide proper projection to the water feature and prevent the pump from burning out is important. Water can evaporate (or be consumed by critters) leaving an unregulated pump to burn out. A water basin can also provide a place for mosquitoes to lay eggs, parasites to form, algae to build and hard water deposits to cling to the sides of the basin. Making sure that the water is constantly flowing will help, but cannot completely prevent nature from taking place. Adding chemicals such as chlorine, chemical treatment tablets and the occasional draining and scrubbing clean of these basins clean will be inevitable if you choose to have a water feature with a ponder basin. 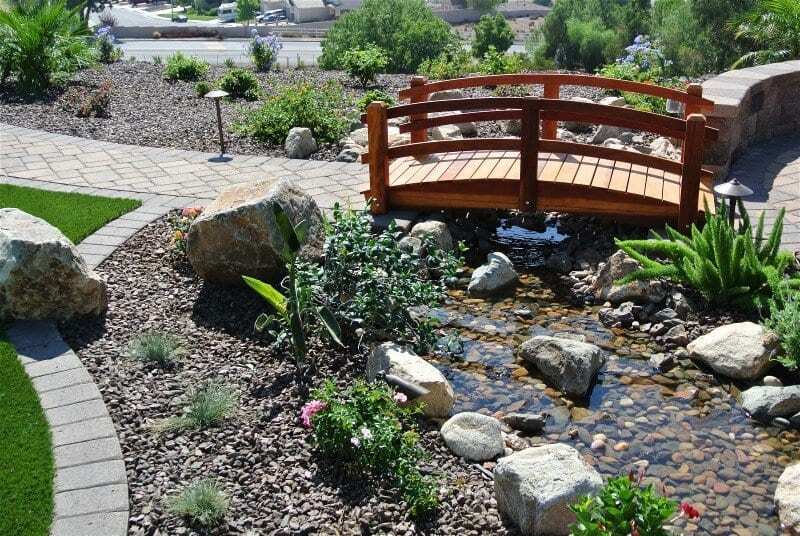 There is a way to enjoy water features in our gardens and landscaping for our Inland Empire area home without having all of the headaches common to water ponds and basins. Go pondless! Pondless water features are the key to achieving the visual effect and audible pleasure associated with fountains and waterfalls, without the pain of constant maintenance. By incorporating a simple catch basin underground and covering it with a material such as river rock or pea gravel will give us a natural look, hide and protect our pumps from the elements and more importantly keep our water from being exposed to the air while not in use. This will dramatically reduce the amount of maintenance necessary. Our water will remain cleaner for much longer and keep those pesky mosquitos away. With traditional the above ground water basin there are only so many ways that you could build a waterscape because the water had to end at a ground-level or be built up. With a pondless water feature design you can incorporate the natural slope of your yard, add in different large decorative rocks, pottery and more. You can really get creative with your backyard theme when you don’t have to accommodate an above ground water basin. Want to ad that touch of elegance and class? Add waterproof LED lights to accentuate the flow of the water and natural positioning of the rocks making your pondless water feature the centerpiece of your next nighttime get-together. Many water flow systems now allow you to turn off and on the water and control the flow via a remote! 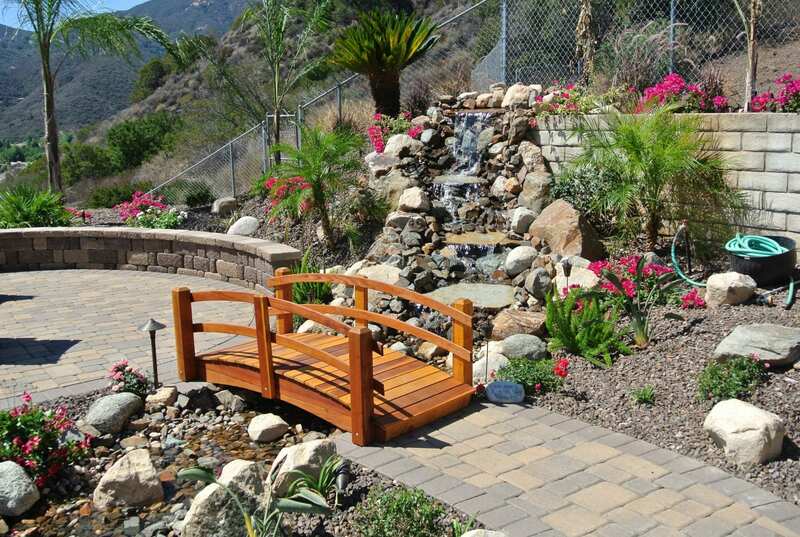 By utilizing a pondless water feature for your Inland Empire area home you can enjoy the sounds of mother nature and bring serenity to your life without the hours of work and maintenance. (Which kills the whole piece and serenity thing). You can simply flip a switch and instantly be taken away to your happy place with the sound of the water’s magical sounds and calming visual effects. Copyright © 2019 | Bella Terra Landscape Design. | All Rights Reserved.